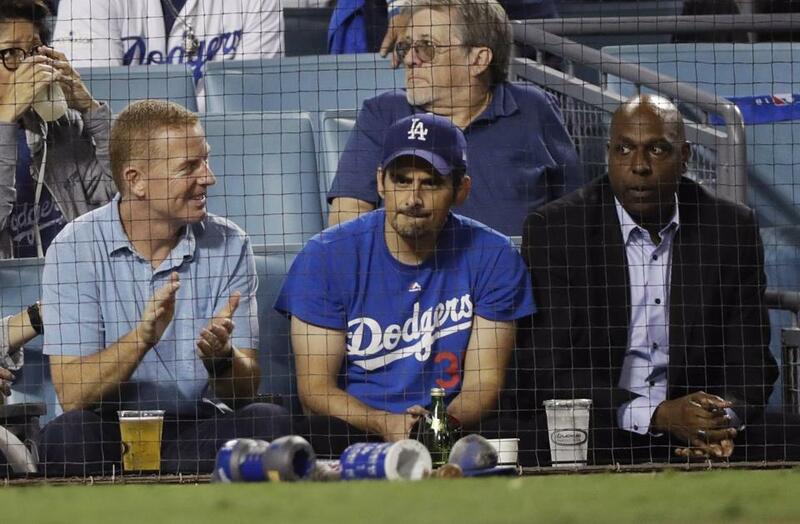 Dallas Cowboys coach Jason Garrett and country singer Brad Paisley watch Game 3 of the World Series baseball game between the Boston Red Sox and Los Angeles Dodgers on Friday, Oct. 26, 2018, in Los Angeles. With the World Series shifting to Los Angeles for Game 3, the stars were out in full force at Dodger Stadium, both during pregame ceremonies and in the audience throughout the game. Before the teams took the field, country star Brad Paisley sang the national anthem, and a trio of Magic Johnson, Tommy Lasorda, and Steve Garvey threw out the first pitches. Nearly every at-bat treated viewers to a look at longtime TV host Larry King sitting behind home plate, while another camera captured shots of Dallas Cowboys coach Jason Garrett, his feet propped up behind protective netting. By the time the ninth inning rolled around, former “Entertainment Tonight” host Mary Hart caught everyone’s attention with her distracting motions as Craig Kimbrel pitched. Perhaps the funniest celebrity-related moment of the night came moments before the game started, when Fox showed a shot of actor Rob Lowe posing for a picture with Dodgers legend Sandy Koufax. Moments later, whoever was running the Fox Sports Twitter account seemingly mistook Koufax for former PBS host Bill Nye. Other celebrities spotted by fans, cameras, or reporters included actors Casey Affleck, David Alan Grier, Jason Bateman, Terry Crews, Mario Lopez, and Danny Trejo; late-night host Jimmy Kimmel; musician Joe Jonas; racehorse trainer Bob Baffert; former MLB commissioner Peter Uberroth; Los Angeles Rams linebacker Morgan Fox, and legendary slugger Hank Aaron.